A small gathering of students and faculty discussed undocumented student resources during an ASUCI forum last Tuesday, stressing the importance of providing support to a population of undocumented students and DREAMer scholarship recipients which has nearly doubled since the 2013-14 academic year. 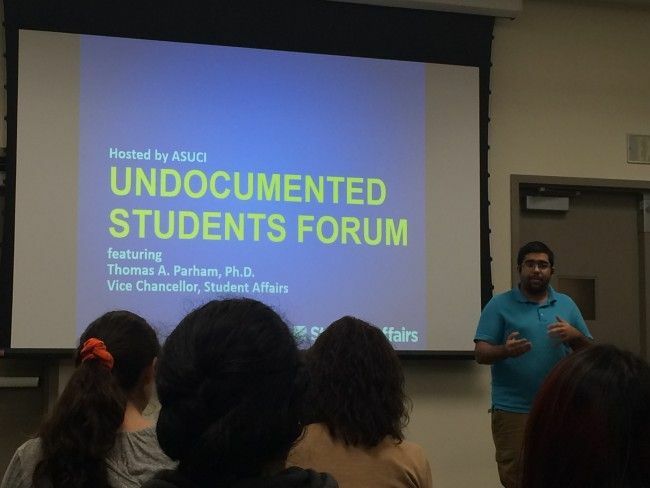 ASUCI President Parshan Khosravi introduces the Undocumented Students Resources Forum to a room full of attendees last week in the University of California, Irvine Student Center. He highlighted plans to provide opportunities for undocumented students to secure internships and to initiate a system of providing food vouchers to undocumented students in exchange for labor. Parham insisted that “there’s no space on campus, period” for an undocumented student resource center, but also said that UCI administration is “currently trying to locate space” for such a center, which would then take at least three to four years to build. Parham noted that, aside from rising tuition costs, one of the primary struggles undocumented students face is food insecurity; he argues that UC Irvine has worked to address this issue with programs including the Oct. 2015 opening of the on-campus SOAR Food Pantry, which served over 600 UCI students as of Dec. 2015. 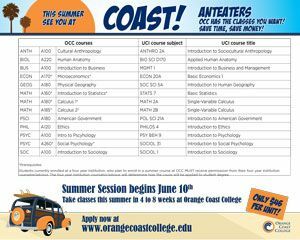 UC Irvine serves the majority of all undocumented students in the University of California system; approximately 500 UCI students are undocumented, out of approximately 900 in the entire UC system. The undocumented population has been steadily growing since the 2013-14 academic year, in which 232 DREAMer scholarship recipients were admitted to UCI. The following year, 351 undocumented scholarship recipients were admitted, and as of this academic year, UCI has admitted an estimated 515. In Oct. 2013, UC President Janet Napolitano offered $5 million to be split amongst the 900 undocumented students at UC’s nine undergraduate campuses. Of this grant, UCI received $250,000 marked for student support services for undocumented students, and $343,000 for financial aid support. Going forward, UC Irvine’s plans to support undocumented students include “strongly urging the UC Office of the President to continue their support for…a DREAMers coordinator position and also financial aid, and pursuing a Student Fee Advisory Committee (SFAC),” said Vice Chancellor Parham at the forum.